The curtain is expected to rise again at one of the oldest cinemas in Wales. 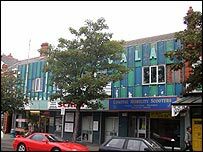 Supporters of Prestatyn's Scala cinema hope it will be returned to its former glory after it closed in 2000. Their long-running campaign has been boosted by a £1.5m grant by the Welsh Assembly Government. Supporter Sandra Pitt wants to see the cinema, which was originally built as a town hall in 1898, showing films again within two years. It was such a loss in the town and it was really missed. Mrs Pitt said: "It's wonderful news. It's been a hard slog and we've been fighting for this for five years. "It will be a mega party on the day that it opens again - the town needs it. "It was just the hub of the community - if you were meeting someone you met outside the Scala." Mrs Pitt, chair of the Friends of Scala, said she hoped it would still be a friendly place. "It was such a loss in the town and it was really missed," she added. The Scala showed silent films before World War I but finally closed due to structural problems in December 2000. One of the first films to be shown at the Scala was the epic of its time - All Quiet on the Western Front. The assembly government is offering Denbighshire Council the grant. The total cost of the regeneration scheme is estimated to be around £3.5m but Mrs Pitt said the group is well on their way to achieving the target. She added: "We hope Denbighshire Council will find some money and the friends need to raise around £100,000." The plans include a twin-screen cinema, a cafe bar and space for theatre and dances. The Scala was converted into a cinema in 1913 by cinematography pioneer James Roberts - who was known as Saronie - and screened its first "talkie" in March 1930. The refurbishment will see London-based architects Burrell Foley Fischer working on the designs. The Scala is one of 13 projects receiving a total of £13m from the Physical Regeneration Fund. Other projects include money for Bridgend Council for traffic works and money to Blaenau Gwent to improve disabled facilities.